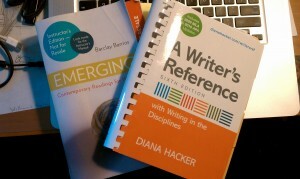 Our class is an introduction to active and critical reading, and to academic, source-based writing. We will work to analyze and to synthesize ideas in our readings, and to develop our own positions on these ideas. Along the way, we’ll explore a variety of approaches to the writing process so that we can locate those practices that work for us. We will write for each class meeting. While some of that writing will be collected and graded, much of it will be preparation for class or for our formal paper assignments. Class meetings will be discussion-based, and will regularly involve both collaborative small group work and brief, informal presentations. For each formal paper in the course, we will complete a first and final draft. We will participate actively and constructively in peer review for our drafts. Peer review is an important element of taking responsibility for our writing. It helps us become more capable readers of others’ work, while also helping us see our own writing from new perspectives. 80% of your final grade will be based on your performance on four (4) formal, revised papers, with later papers weighted more heavily than early papers. 20% of your grade will be based on homework and informal writing, on attendance, class participation, and peer review, and on occasional in-class quizzes. Buying used can often save us a good deal of money and so I’m all for used books! But please don’t buy the wrong book or you’ll have some trouble. There’s little risk of the wrong edition with Barrios since his book is brand new. There are dozens of Hacker books out there, however, and only one is correct for us. Use the ISBN to help you out, especially if you try to buy a book outside of the bookstore! These books are pricey. 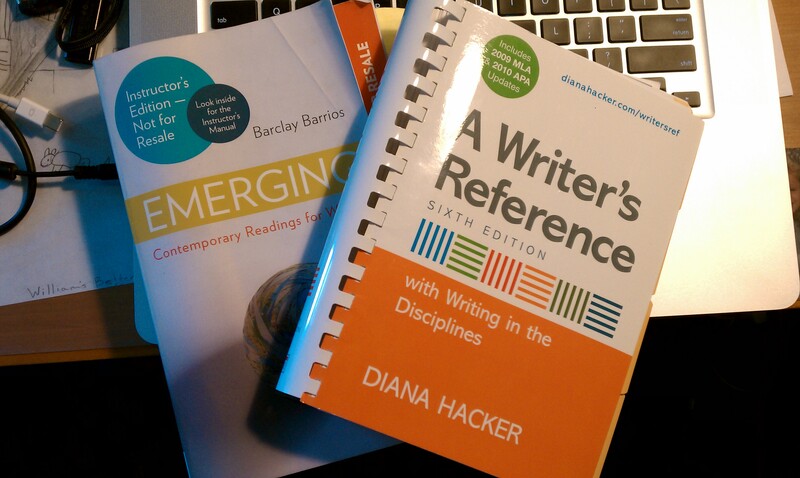 With Hacker, you’re buying a reference that will belong on your bookshelf throughout college. It is an investment. With Barrios, you get some very interesting and important writers. If you don’t find yourself wanting to read more of the readings than we take on in class, just sell the book back at the end of the term and get some $ back. Outright failure to acknowledge the sources of your ideas or words will be treated as a violation of academic integrity. As such, you should expect to fail a paper (and, quite possibly, the course) if you use someone else’s work (from a student, from the web, or in print) without attribution. I don’t bite and I enjoy talking with my students. Please arrange to meet with me if you are having any trouble with the class, or if you just want to talk. Homework (reading questions and other smaller assignments) is due on the due date. Since this work actually advances our class discussions, late homework will not be accepted. You can miss two homework assignments with no penalty. We have a “working” schedule. This means that assignments and due dates are subject to change as the class unfolds. I will certainly inform you of any changes as they come up.